During Constitution’s cruise around the world between 1844 and 1846, the ship’s crew spent two Christmases far from home. It was only natural that the sailors tossing on the briny deep or languishing at anchor in a foreign port would take time to make merry and remember loved ones on the holiday. 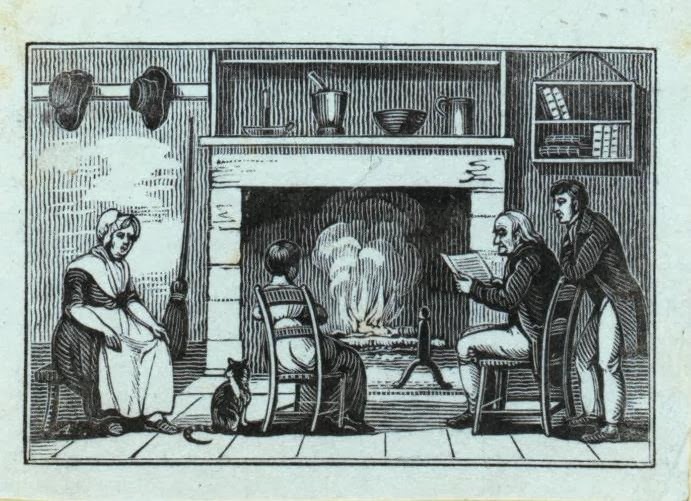 A happy domestic scene, something a sailor on a foreign voyage yearned for, and never more than during the holidays. Ship’s carpenter and Virginia native Henry George Thomas also recorded the crew’s festivities on the same Christmas day. There have been some special liberties extended to the men and prayers and quiet thoughts turned toward home and Gosport [VA] this special day. The carpentry shop has made a goodly assortment of ornaments to rig below. Captain Percival has given permission for a grog to be served the men with extra rations for the crew. Despite the light hearts and light heads, there was sorrow in the day as well. Decorating, feasting, and comforting the sick were as much a part of Christmases past as Christmases present. Lt. John B. Dale Journal, 1844-1846, New England Historical Genealogical Society. Henry George Thomas Journal, 1844-1846, USS Constitution Museum.